March 9, 2015|Posted in: Let's Eat! Sugar Cookies – I used 2 rolls of the ready to bake kind. Fruit – A variety of fresh fruit choices, washed & cut into bite sized pieces. Directions: Soften the cream cheese in the microwave for 20-30 seconds, add whipped dessert topping and sugar and mix well. 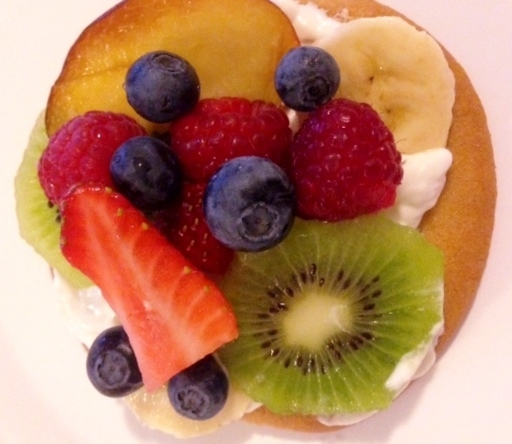 Spread the topping on the sugar cookies, add fruit and enjoy! 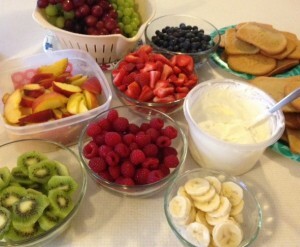 Healthy Hint: go easy on the cookie and topping and heavy on the fruit for a healthy treat! !